Inside Xbox livestreams their major Xbox One announcement and highlights of X018 Event from Mexico City. Mexico City was lightening up this weekend, with the return of Microsoft’s Xbox fan event X018 for November 10-11. Courtesy of Inside Xbox, this entire fan-fest is going to be streamed live for those who couldn't attend the program in person. More than over 10,000 fans came to celebrate this fourth-annual event and have first look at the upcoming projects. Team Xbox members are bringing in some major announcements on video games are heading this way for players on PC and Xbox One. Since the live broadcast started long before the actual show, we advise you to skip to 29:51 for the announcements to roll in. Cheers! When people heard that Microsoft's action-adventure title Crackdown 3 won't be at E3 2018 and the game is pushed to 2019, people were generally disappointed. X018 makes up for all the frustration and delivers new news on the game. An all-new multiplayer mode Wrecking Zone is showcased in a gameplay video into an open-world, where you destroy every piece of in-game environment with explosives and advanced weapons to take down your enemies. The Netflix equivalent of gaming, Xbox Game Pass subscription service is really offering a blast by announcing to add a total of 16 new titles and the first one they included is a worldwide battle royale sensation, PlayerUnknown’s Battlegrounds. PUBG will be followed by Thief of Thieves, while Agents of Mayhem, MXGP3 and Thomas Was Alone will join on November 22. Hellblade: Senua’s Sacrifice, Kingdom: Two Crowns and Ori and the Blind Forest arrive on December. Other indie titles that are coming to Xbox One are Aftercharge, Mutant Year Zero, Pathologic 2, Secret Neighbor, Supermarket Shriek and The Good Life. 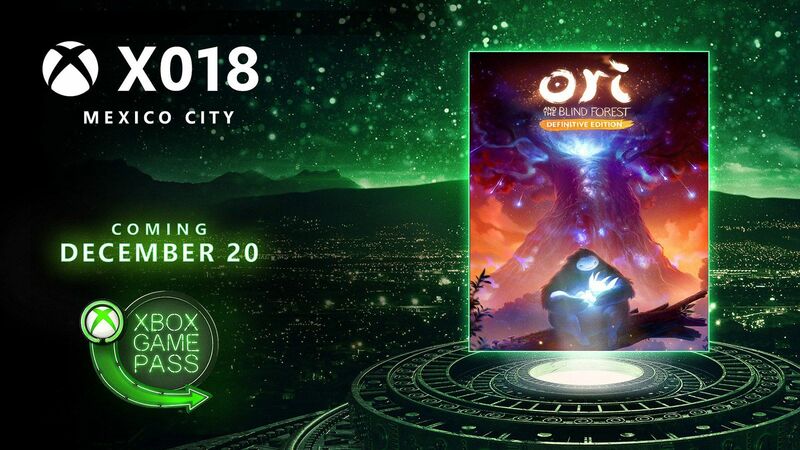 Upcoming platform-adventure Ori and the Will of the Wisps will be available at launch in 2019. Don't forget to try out the Xbox Game Pass app on App Store or Google Play for Android and iOS to download your games straight to your console. Also, signing up for membership right now will get you the first full month for $1 only. Although Halloween is over for this year, another holiday season is headed this way fast and prepare for the biggest Black Friday sale of ages, because you can get a $100 off on Xbox One consoles and that brings it to the lowest price ever. Just like the Xbox Game Pass offers, you can sign up for Xbox Live Gold to get your first month for only $1. Get Disneyland Adventures, Forza Horizon 4, PUBG and State of Decay 2 for 35% off or go for Forza Motorsport 7 and Sea of Thieves to get 50% off. 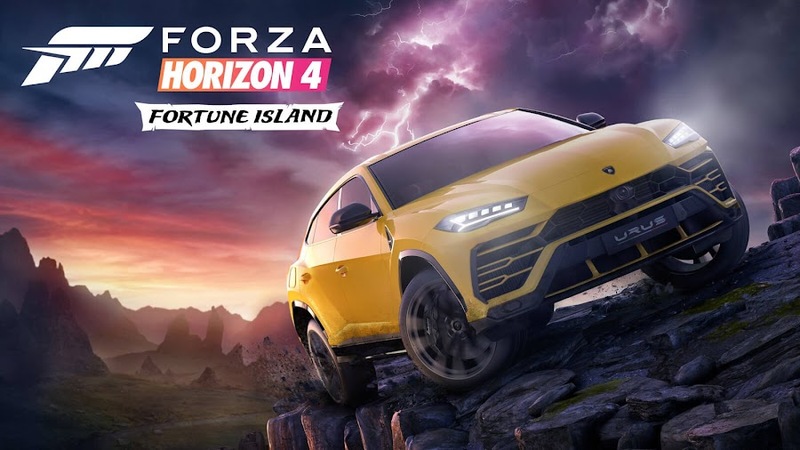 Latest installment of the open world racing game Forza Horizon 4 from developer Playground Games has just announced their first expansion "Fortune Island", which is coming on December 13 to take players to the northern reaches of British Isles. This is going to be a lot more fun and exciting experience as you will now be driving through dangerous cliff side roads and mountain switchbacks under the extreme weather condition that brings in fierce lightning storms. Another fine addition to the game is all five of Ken Block’s Ford vehicles as a courtesy of GymkhanaTEN franchise. These custom-built powerful machines will be added to the game on early November for Car Pass members. Fortune Island comes along with the Forza Horizon 4 Expansions Bundle worth $34.99 only for a total of two. If you have gotten your hands on the Ultimate Edition or the Ultimate Add-Ons Bundle already, you won't have to worry about that at all. Action-adventure game Sea of Thieves is getting a free content update soon, which will be the fifth one since launch and will introduce a PvP game mode called "The Arena" to test out their skills against each other in competitive matches. Players will take part in a race to find treasure and beat your rival crews while the clock is ticking. Also a new Trading Company called the Sea Dogs is introduced, who will offer you goals and rewards, while a new-tavern area is included as well. This November 16, zombie survival game State of Decay 2 is going to release their next content the Zedhunter Pack. This one comes with a very cool silent crossbow to hunt down zombies and there are some useful melee weapons to use as well. Now that four million players have joined the community, this free update will be the first among a line of other planned updates for 2019 like a brand-new gameplay setting and Return to Trumble Valley DLC that features a map from original State of Decay. A game that is heavily inspired by BioShock and System Shock 2, strategy-shooter title Void Bastards take you back to derelict spaceships floating out in the empty space and players are tasked to protect a group of misfit prisoners from Sargasso Nebula. The game is coming as a console launch exclusive to Xbox and it is unlike any other first-person shooters that you know of. So, hone your combat skills and go look for supplies to scavenge in an animated style graphics that is on the nose. The trailer showcases all Xbox One X enhancements for the upcoming anticipated first-person shooter Battlefield V from Electronic Arts and DICE. The 4K Ultra HD and HDR support only makes the experience of the war of an already great game even greater to players. While the game looks like an overall improvement of previous title Battlefield 1 and it actually is, the enhanced visuals only empowers its good looks. So, not only you are playing a better title but leading your squad to victory is more enjoyable with the latest console. Publisher Bandai Namco has revealed an exclusive first look of two most anticipated manga characters for their upcoming 3-on-3 tag team fighting game Jump Force. They are SSGSS Vegeta and Golden Frieza from Dragon Ball universe. Also witness SSGSS Goku and SSGSS Vegeta unleash their fury in an epic battle against a common enemy, Golden Frieza in the "Awakening" trailer. The tide of the fight is then shifted and now the villain gets the upper hand to show his moves. 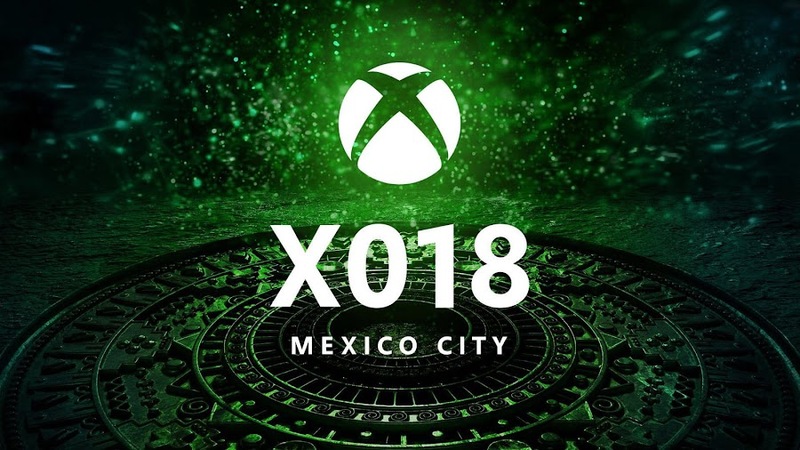 With all the features, games, supports and updates coming for Windows and Xbox console, people in Mexico City really got a blast out of X018. Xbox Game Pass got the best part from the entire show as they got a lineup of more than a dozen games for their members. Also, Microsoft worked up their game development section really good this year by working with so many new companies and now they have two more promising studios to work with. Hopefully, players on their home console will see a great number of exclusives in the foreseeable future. 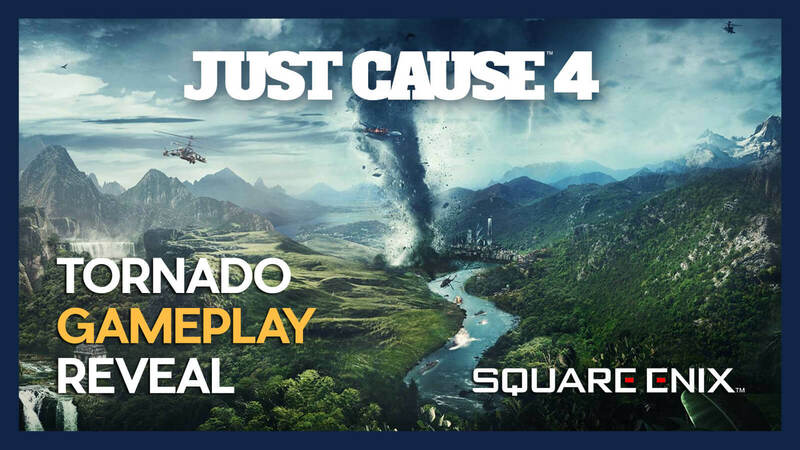 Aside from taking down evil organizations, Rico Rodriguez chases down destructive tornado in Just Cause 4. 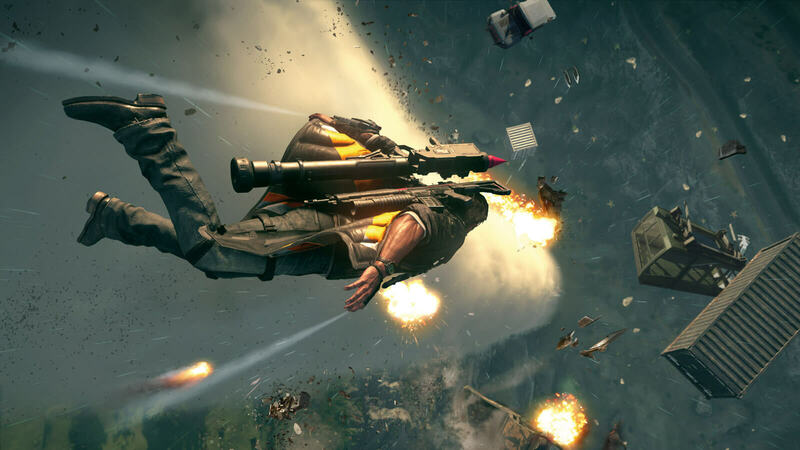 Three years after the release of Just Cause 3, action-adventure title Just Cause 4 got leaked through a Steam listing shortly before developer Avalanche Studios and publisher Square Enix could officially announce the game during E3 2018 press conference. People who were looking forward to see protagonist Rico Rodriguez back in action got what they wanted and a gameplay trailer was revealed too. Recently at Gamescom 2018, another gameplay trailer is dropped for the game. Below is a brand-new video displaying use of gadgets at Rico's disposal and how he tame a tornado after chasing it down. The trailer heavily focuses on extreme weather within the open-world of this titular action game and how our hero handles it. As he goes to Solís to stop the tyrannical paramilitary group called The Black Hand, he faces some climatic obstacles. 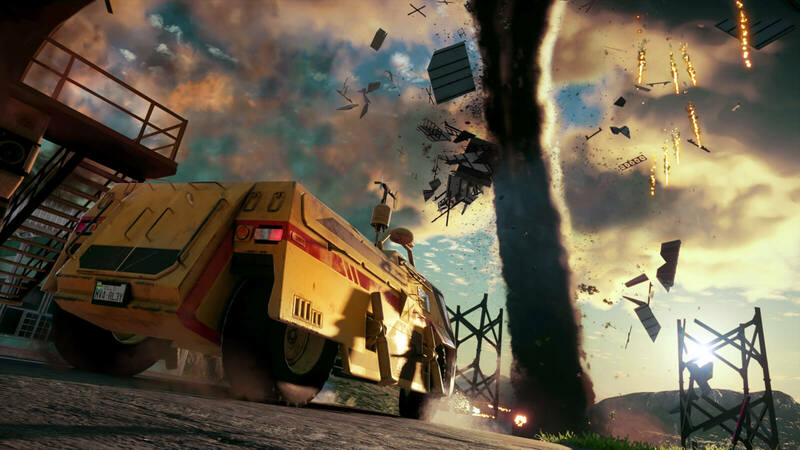 There is an armored vehicle called the Storm Chaser, which Rico uses to chase a towering tornado by taking down a few wind cannons placed there to keep it under control and divert the wind from current course while it takes down everything on its way. To take down one of those wind cannons, he uses a railgun and this weapon has a secondary fire option like any other guns from the game. He can also take assistance from a drone and use it for grapple point. The developers used a redefined version of their Apex game engine to create a dynamic weather system that obeys the laws of physics during blizzards, rain, storms and devastating tornados. Avalanche just teased us what sort of destruction real-world climate change can cause in future. 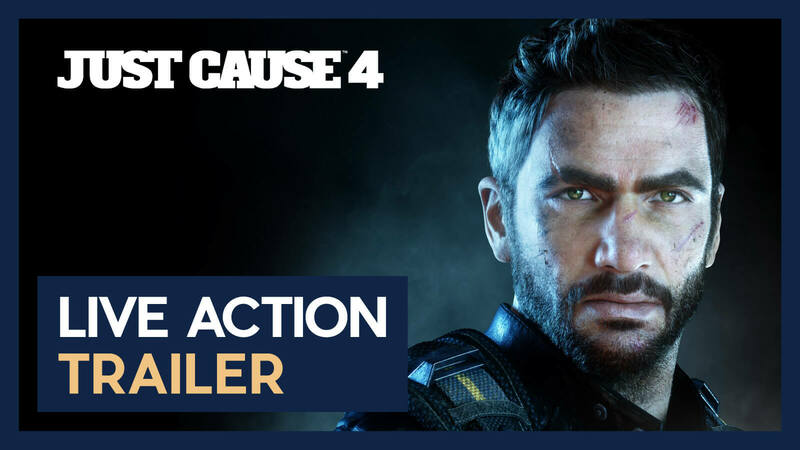 Before Just Cause 4 finally launches on December 4, 2018 for PC, PlayStation 4 and Xbox One, we will probably know more about the game from the developer and publisher. So far, the game looks more like its predecessor Just Cause 3 and despite having many gameplay mechanics tweaked, people are still skeptical because that game had a mixed response from fans in general. 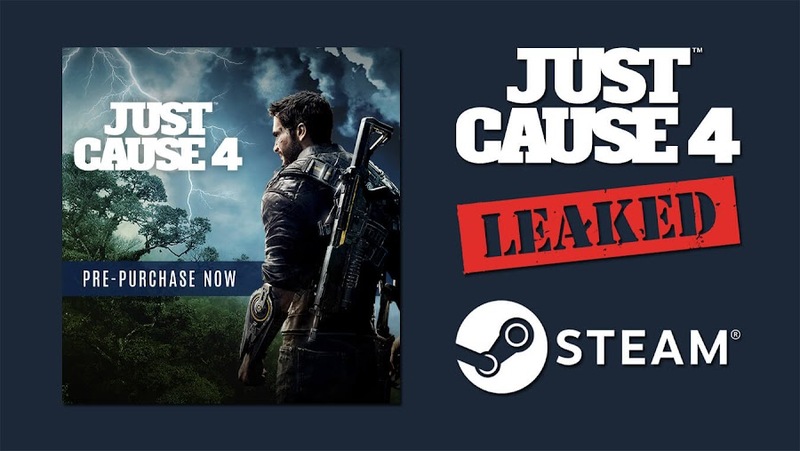 Avalanche Studios’ next game from Just Cause series is confirmed via another leak on Valve’s Steam store. Swedish developer Avalanche Studios was responsible for creating open-world action-adventure game Just Cause in 2006 that successfully spawned two more sequels; Just Cause 2 in 2010 and Just Cause 3 in 2015. Ever since the last game from the franchise dropped three years ago, many fans of the series were hoping that a new game will be announced anytime. 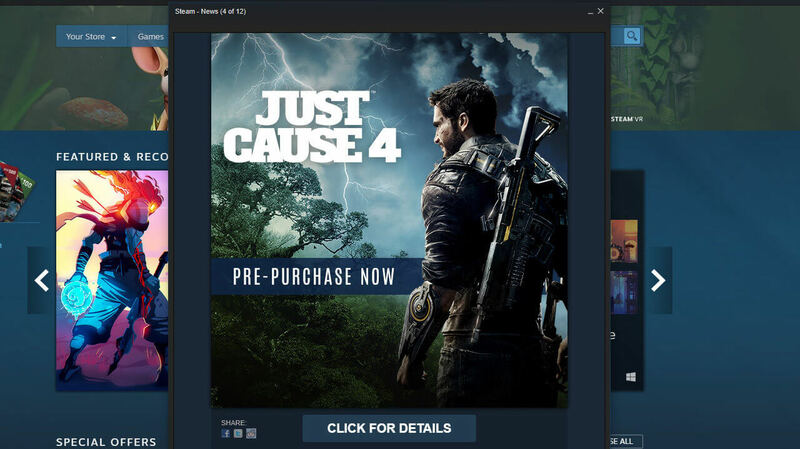 Those players may rejoice as Valve’s Steam store has accidentally revealed Just Cause 4 with an ad recently. Shortly after an announcement for their upcoming cooperative first-person shooter Generation Zero, this leak was found. 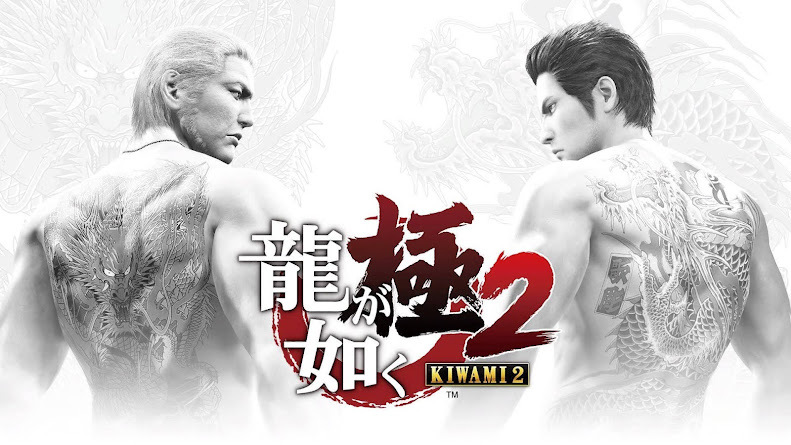 The advertisement encouraged players buy the game ahead of its release on Steam and that's a way of confirming the third sequel. Also, protagonist Rico Rodriguez is going to make a comeback and the game will be available on PC, according to the image and the fact that this ad was on a platform that digitally distributes video games for PC. Hopefully, a PlayStation 4 and Xbox One version will be there too. It was first spotted by one of the stuff member of Kotaku and now almost everyone knows this. 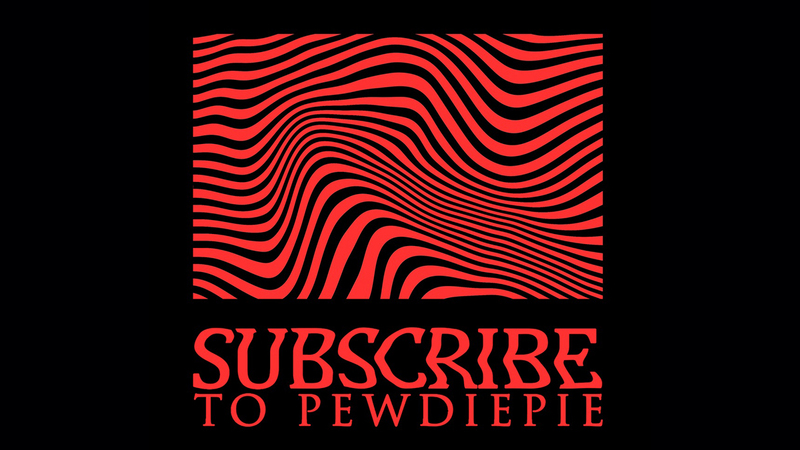 Though any promotional image has not yet been released by developer Avalanche Studios or publisher Square Enix but the Steam commercial did it in advance. The game was probably meant to announce next week as E3 2018 is here now but unfortunately bust out early. Also, it means very soon some trailer may release and the game itself will be available for pre-order as well. 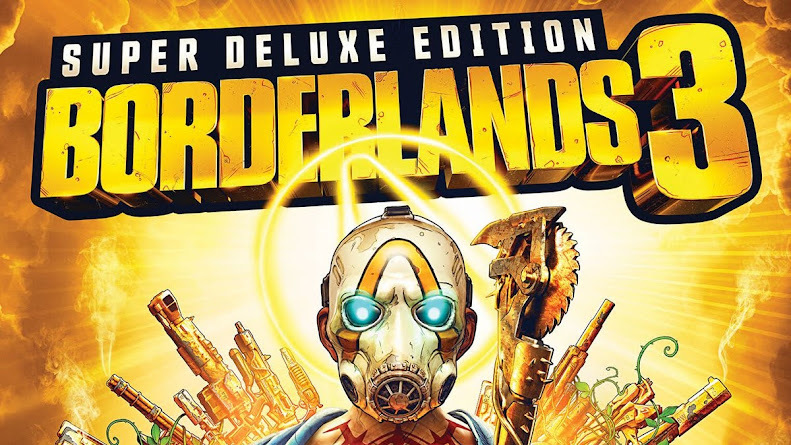 Few weeks ago, post-apocalyptic open world shooter RAGE 2 from the same developer studio was also leaked unexpectedly from an advance Walmart listing and received confirmation shortly from publisher Bethesda Softworks. Since Square Enix was in charge of publishing the last installment of the series, they will be back again with this new game while Avalanche manages to market Generation Zero on their own. One thing that we can all agree about is that Just Cause 4 is indeed a real project and not a hoax. Among many other Walmart Canada leaks, this game was mentioned as well and we can only hope that the rest will also be announced very soon in E3 press conference or maybe after that. This means, we can eagerly wait for confirmation of Forza Horizon, Gears of War 5 and a new Splinter Cell game.